This is the most popular purse in my collection. Several of my friends have borrowed it for their wedding day, as well as a couple of friends of my daughter for prom. 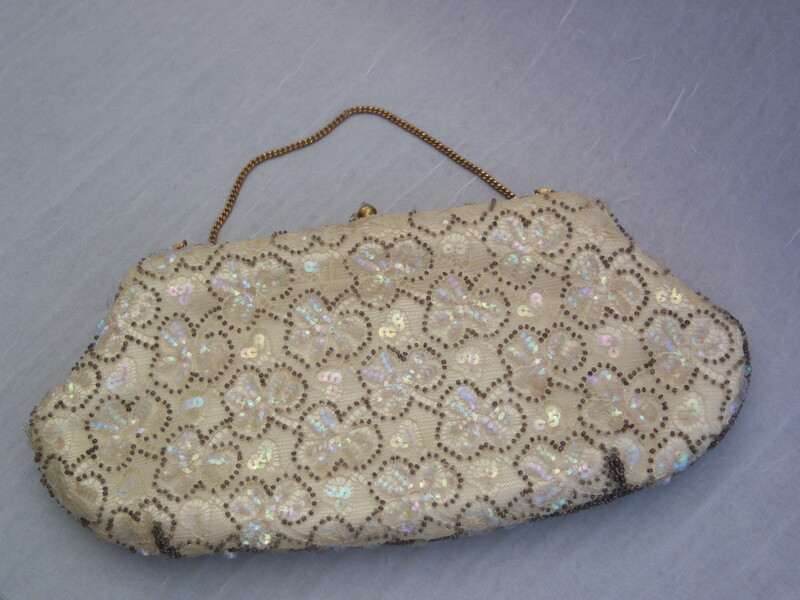 It is patterned with sequins and crystals sewn on to it and is a lovely ivory shade, making it a perfect vintage accent. Here’s another bridal/prom favorite. 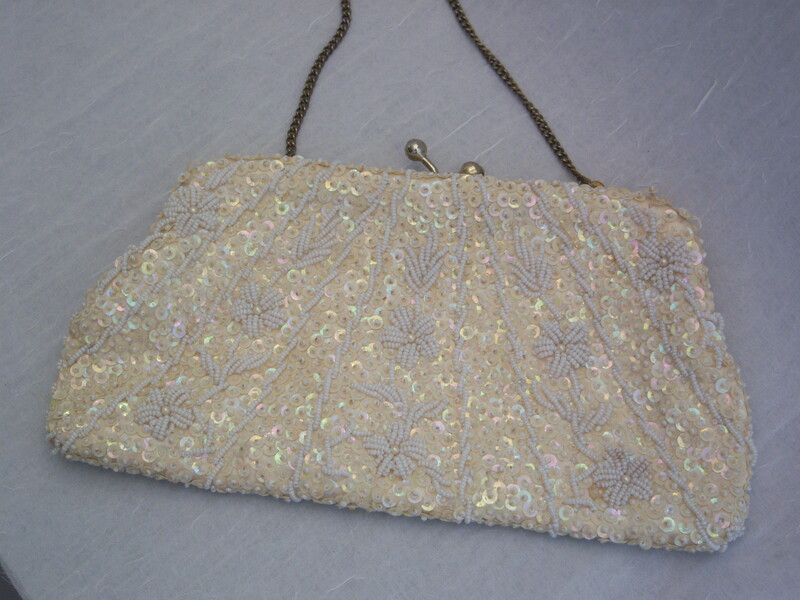 It is embroidered all over with white seed beads and sequins. 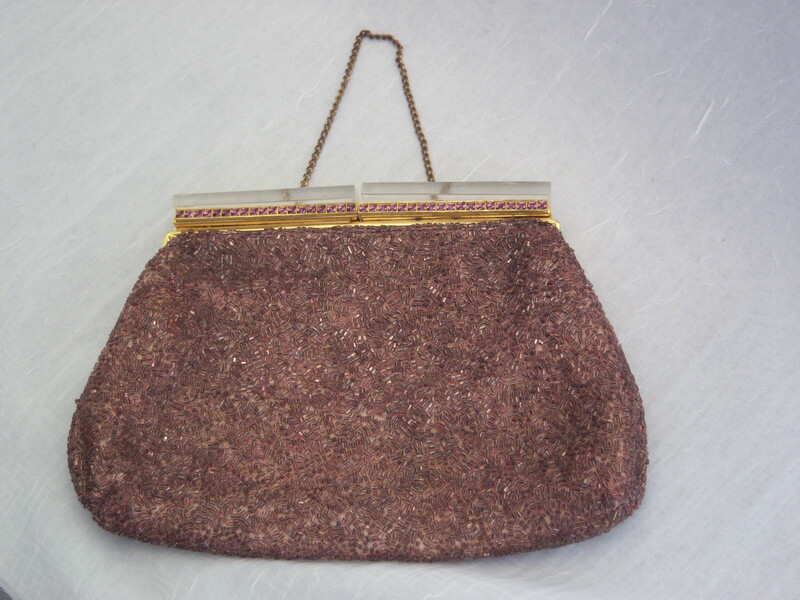 While I love my huge purses, there is a part of me that wishes to be back in the time of elegance, when all a woman needed to carry was a lipstick and a handkerchief in a gorgeous purse like this. Ever since I was a young girl, I have been fascinated by jewelry. 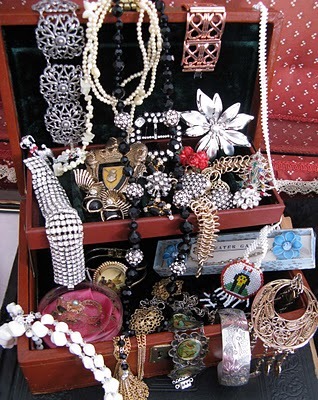 I spent hours with my mothers’ jewelry box, examining and trying on every piece of jewelry in her box. I would wear my mothers’ jewelry whenever I got the chance. In fact, I was wearing her class ring one day when my friends invited me to the beach. I forgot I had the ring on, but when I came home it was no longer there. It was so hard to look at my Mom and tell her I had lost the ring. We went back to the beach and searched and searched but the ring was never found. I know she was disappointed in me and in the loss of her ring, and I am still disappointed in myself. The only time I ever remember being punished by my parents revolves around my kleptomaniac tendencies with my mothers’ accessories. I was in my room playing, wearing my mothers’ watch. I was oblivious to the commotion in the other room, but apparently there was quite a search going on for the watch. Was my Dad ever mad when he found out I was wearing it without asking because my Mom had been so worried. I went without supper that night for the only time in memory. I think that’s when I decided to start collecting my own jewelry.